As a strange consequence of my employer’s custom of pair programming I acquired an interest in mechanical-keyboards. I have now bought a couple—one for the office and one as a backup at home. Here is a quick review of one of them. So I wanted to acquire a mechanical keyboard. 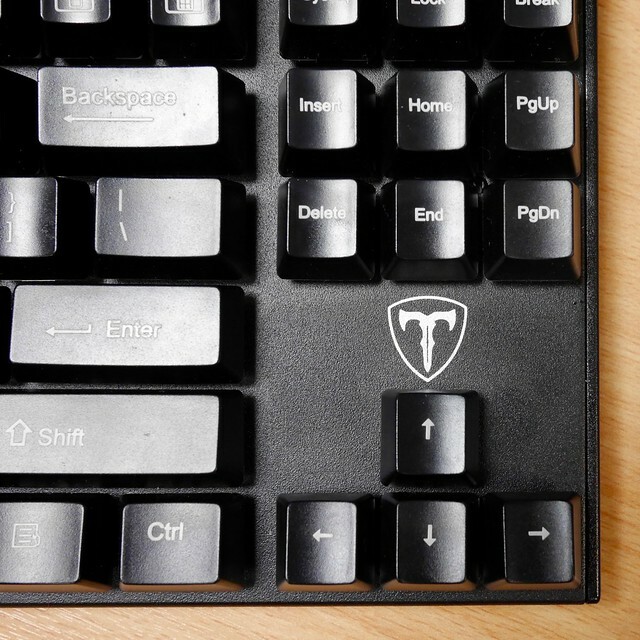 I started by trawling through useful sites like Deskthority, the Keyboard Company, and a well-known online retailer trying to find a keyboard I liked the look of. 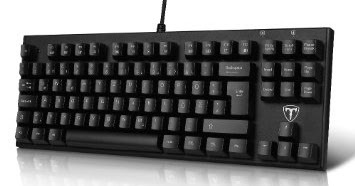 After looking at keyboards costing £120 or even £200—and not even sure whether I want a mechanical board enough to gamble that much cash in one go—I instead plumped for a £27.99 tenkeyless Easterntimes Tech I-500 (listed on Amazon as ‘VicTsing 87 Keys Mechanical Gaming Keyboard’). The idea was that if I didn’t like it, at least I would not have spent all that much on it. The trade-off for being so cheap is that it is fairly barebones: the keycaps are OK but the legends are already wearing off, there is no USB hub, and none of that under-key lighting that is so much the rage these days. The keycaps are OK—black with white pad-printed legends that are already turning greyish on the keys I use the most. 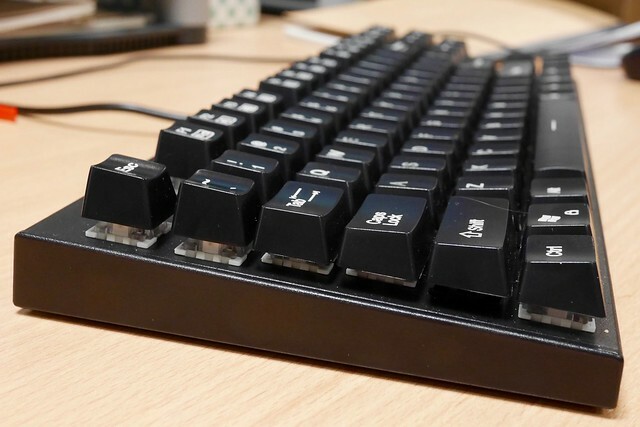 The symbols and letters are not beautifully aligned, and the F-keys have ugly boxed media-function symbols printed on the top (rather than the front). There are no dip switches for swapping Ctrl and Caps Lock, or for swapping the OS and Alt key. This means that on a Mac you have to remember that Option is to the right of Command; I’m used to either using Ctrl (on Liinux) with my little finger, or Cmd with my thumb, and having to remember to press the key in the middle is confusing! The blue switches sound louder than genuine Cherry blues. This is probably exacerbated by the lack of upper case and the rigidity of the steel plate. There is also a certain amount of pinging from the plate itself. This is great for making a racket in private but possibly a bit too much for the office. What I like about it is that it has a certain steampunk-y, fethishy aspect to the design. The floating keys style shows off the switches’ transparent plasticky underthings. The case is basically a minimalist black slab with a sort of gothic-looking logo. Supposedly the keyboard is waterproof, but I have not tested this. You can see a Easterntimes Tech I-500 review on YouTube that does test this claim, however. All in all this is a surprisingly good keyboard for the price, though better suited to a PC or Linux user than on a Mac because of the swapped Cmd/Alt pair.